I was particularly happy with this yarn when it finished this morning and wanted to let you all see a picture. This is a 100% merino yarn that I dyed with this intention of making socks for all of the men in my life (that would be four of them, one large version, two teenagers, and a wee baby who loves handknit socks). It is so pretty and subtle that I’m thinking about hijacking it though. Even if I use it for its intended purpose, I still have a good bit extra, but it is going to be a temptation to use it all for something really beautiful for myself. It was hard to take a photo that captured the full color range on this one — it goes all the way from silvery grays, through a golden brown and on into a deepr burnt umber brown, before going to a true black. I left several areas of white — in much smaller bands — which will give this yarn a lovely faux fair isle look when knit. 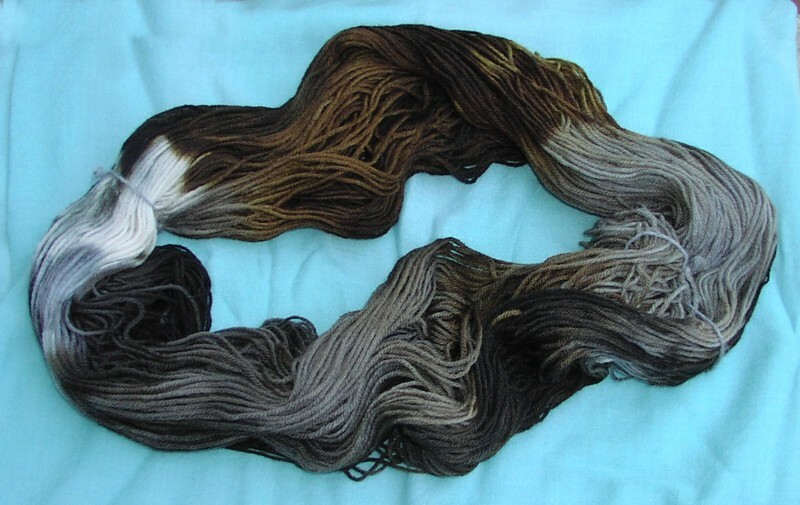 You get more of an idea of the colors looking at the untwisted skein. 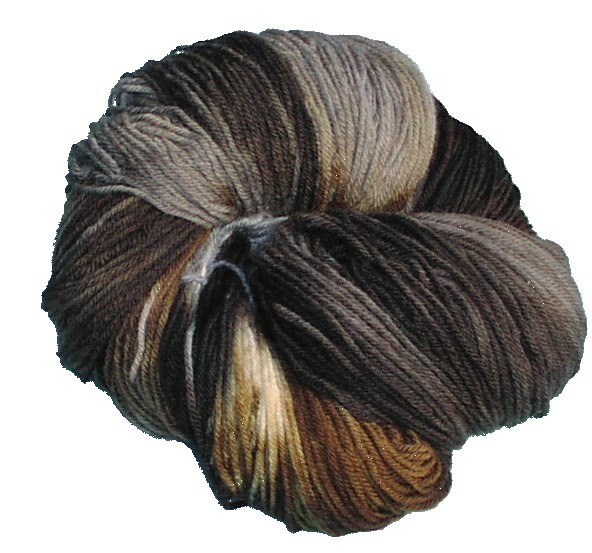 Ohhh Purty.. reminds me of one of the noro colorways… 84 I think it was? I made a clapotis with that and the colors were lovely! When I look at this yarn it makes me want to get a nice coffee with cream. i’m still working on figuring out how to respond to each comment individually on typepad–it’s not as easy as it was on live journal, but i wanted each of you to know i appreciate your comments. i’m going to wind it in to big beautiful balls tonight and then tuck it away because…..the yarn for the oh jan dress came in the mail today!!!!!! That is just so gorgeous. I can’t wait to see how it knits up! I’m just loving those browns! I can see a pair of socks for my dad in them, lol. BTW my Jan yarn came yesterday. I’ve got 3 projects that I’m determined to finish before I allow myself to start a jan dress. Gotta go knit! you had better get busy miss rita 🙂 i’ve got the sweater to finish, and then i’m going to knit oh jan at the same time as a baby sweater for a pregnant girlfriend. i’m trying to save the sea silk shawl for our vacation to calloway gardens — it seems like that would be a peaceful venue for tackling lace. 27 years I ago I bought a Joyce Hand Knit sweater from a local boutique called Molli’s when I first starting practicing law . . . to remind me: that without art, that handmade from the heart, there is no balance. Now I’m retired, but my sweater is not. I hand washed it again this morning. Now the colors in it are inspiration for my paintings, and the love that went into it, well, thanks for sharing for so many years. Please help mend the torn fabric.